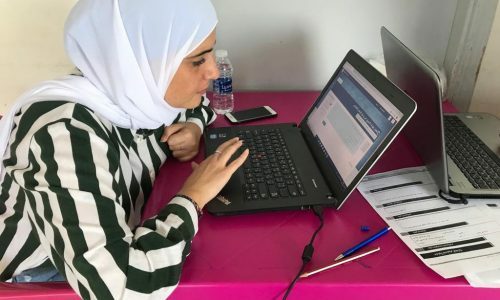 In the Bekaa area, young Maysaa, a beneficiary with special needs had been recently enrolled in the Social Media Marketing course. Coming from a deaf and mute family; Maysaa had lost her hearing senses since birth and did not have any verbal expression. Nevertheless, after defying challenges and successfully graduating from the Digital & Media Literacy training course, she didn’t hesitate to take on the Social Media Marketing courses. The youth couldn’t be more excited to assist her throughout the course; it was a definite challenge for everyone but with her effort and persistence to graduate this program, Maysaa worked hard to actively participate in all 6 modules and prove that nothing differs her from her colleagues. Despite her loss of hearing, she was capable of understanding her trainer and quickly applying what she had learnt. Furthermore, Maysaa’s work among her teammates did not cause any delay: she took charge of the visual tasks she could do on her own, without any verbal communication. For Example, she was using her email address for the group activities and created the Facebook page and Instagram account. That being said, Maysaa was offered a job recently after she acquired Social Media skills, to become the only provider for her disabled family.